No one goes to restaurants specifically to lose weight — but for most people, it's also unrealistic to stop eating out altogether. Luckily, Brian Wasink, director of the Cornell Food and Brand Lab and a leading food psychologist, just came out with a new book called "Slim by Design" that looks at how even minor factors —like whether your server asks if you want a to-go box before you order or where your hostess seats you have any impact on how many calories you consume in one sitting. "We recently visited 27 restaurants across the country, and we measured and mapped out the layout of each one. Some restaurants we visited for only one or two nights, but at one restaurant we collected every receipt for every day for three straight months. At the end of three months, our Restaurant War Room back in Ithaca, New York, looked like a recycling center. It was full of huge bags stuffed with receipts that were wrinkled or wadded, smeared with steak sauce or wine stains, and autographed with things like “Thanks, Tiffany” and smiley faces. By analyzing these A-1-smeared artifacts, we were able to figure out whether somebody at Table 91 way in back was more likely to order salad or less likely to order an extra drink than somebody at Table 7 —which is way up front, next to the door and bar." Are there fat tables in restaurants? This is preliminary, but so far it looks like people ordered healthier foods if they sat by a window or in a well-lit part of the restaurant, but they ate heavier food and ordered more of it if they sat at a dark table or booth. 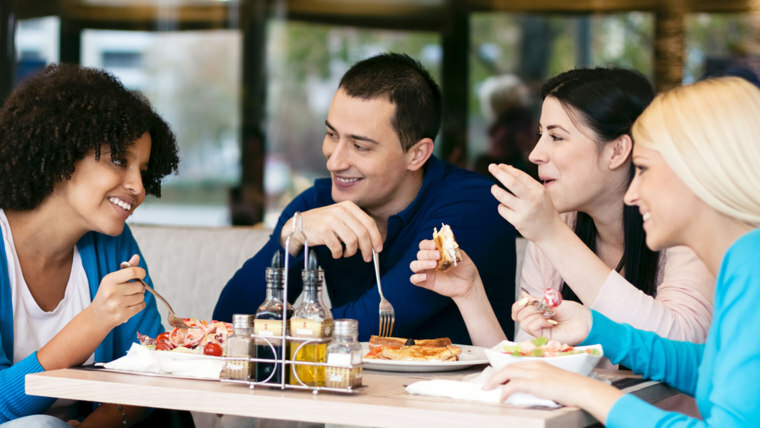 People sitting farthest from the front door ate the fewest salads and were 73 percent more likely to order dessert. People sitting within two tables of the bar drank an average of three more beers or mixed drinks (per table of four) than those sitting one table farther away. The closer a table was to a TV screen, the more fried food a person bought. People sitting at high-top bar tables ordered more salads and fewer desserts. Some of this makes sense. The darker it is, the more “invisible” you might feel, the less easy it is to see how much you’re eating, and the less conspicuous or guilty you might feel. Seeing the sunlight, people, or trees outside might make you more conscious of how you look, might make you think about walking, or might prompt a green salad. Sitting next to the bar might make you think it’s more normal to order that second drink, and watching TV might distract you from thinking twice about what you order. If high-top bar tables make it harder to slouch or spread out like you could in a booth, they might cause you to feel in control and to order the same way. Does sitting in a dark, quiet booth in the back of the restaurant make you order more dessert? Not necessarily. It might be that heavy dessert eaters naturally gravitate to those tables, or that a hostess takes them there out of habit. Regardless, we know that lots of extra calories coagulate where it’s dark and far from the door. Of course, that's not the only factor that affects how much food you eat. Eating off of red plates all might help you consume fewer calories. Granted, with all of these, there's an association—one factor doesn't necessarily cause the other. Still, it's worth remembering. "We have an expression in my Lab: 'If you want to be skinny, do what skinny people do,'" says Wasink. " If you want to stack the deck in your favor, think twice about where you sit."